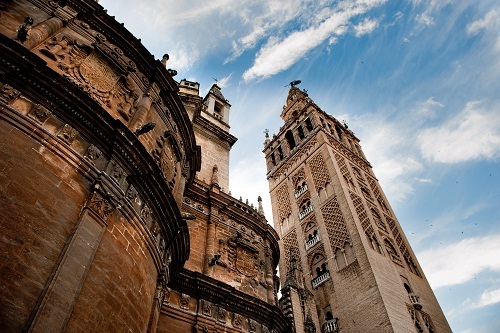 The best expression about the essence of Seville is the happiness. This city of almost 3000 years of history will win your heart for its way of life of sevillians, an open people with the rest of the world and hospitable to enjoy and share each moment. We can find this magical spirit in the streets, which makes Seville a very special city, amazing site full of stories and prosperous towns which left an important trade, permanent for the sevillian population. This legacy has created along the pass of the centuries our cultural, monumental and artistic heritage, like for example the biggest Gothic Cathedral in the world, the beatiful Alcazar or the Golden Tower. Seville has been the scence of important events and expositions like the ibero-american exposition in 1929 or the Universal one in 1992. The fertility of the lands and its favorable weather with soft winter and almost 3000 hours of sunshine in the year, (if you have visit it in august when temperature reaches 47ºC in shade, may be it is no t so favorable weather in your opinion), attracted also old civilizations, like Phoenicians and Carhaginians to live in this shore, Tartessos and important emperors as : Trajan and Adrian . Join a Group and enjoy a Sightseeing Tour of Seville, Visit the Jewish quarter, Royal Alcazar, Cathedral - Giralda, Plaza de España and Flamenco Show (available with different options). 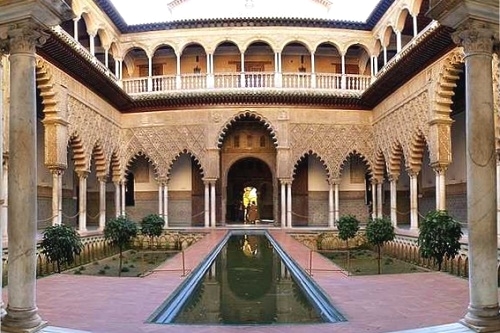 Visit the Royal Alcazares, World Heritage and one of the most remaining examples of Mudéjar architecture, the Cathedral - Giralda of Seville, the largest gothic cathedral of the world. We will end the tour with a Sightseeing tour, where you will learn more about famous monuments of Seville such as the University, an Old Tobacco Factory, the San Telmo Palace, The Golden Tower, Isabel II Bridge or the Macarena Basilica. 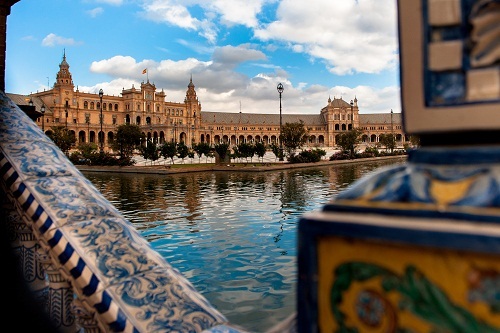 You will also discover the Plaza de España, the centrepiece of the 1929 Iberoamerican Exposition. For your evening, enjoy a Spectacular event of Flamenco and Gastronomy, which runs daily at 7pm and at 9pm , and last about 1 hour and 30 minutes each. In addition, you can accompany the show while tasting the best of the new Andalusian cuisine, with a Dinner à la Carte, a Dinner-Tapas or, with a Glass of your favorite Drink. Return Point & Time: Drop-Off not included / The tour will finish at 1:45pm approx. Flamenco Show (available with different options).